Just after the first nettles, the first dandelions are ready to eat. 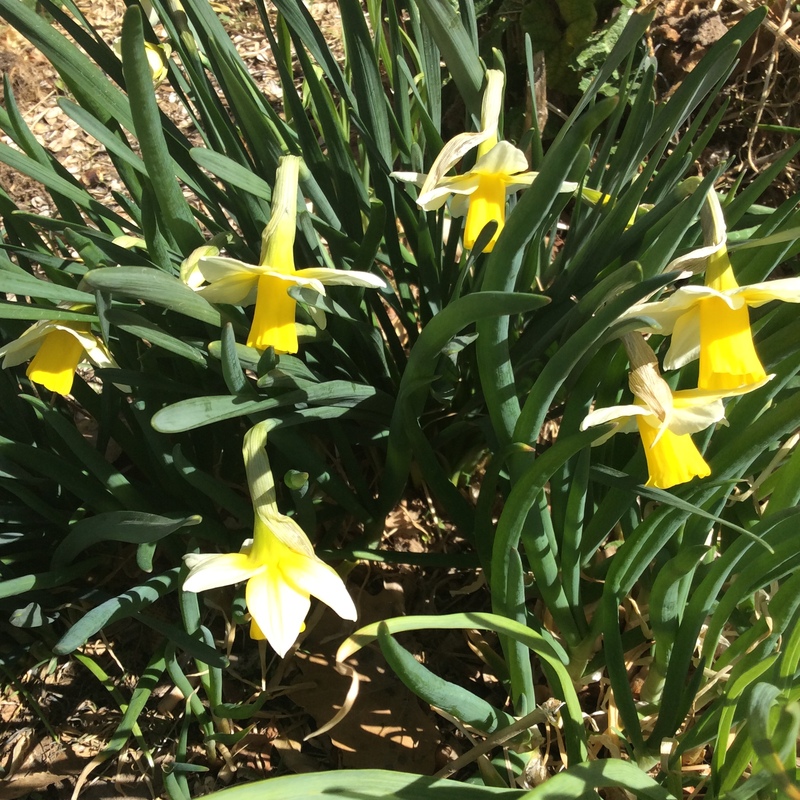 This happens about the same time that the earliest daffodils bloom. 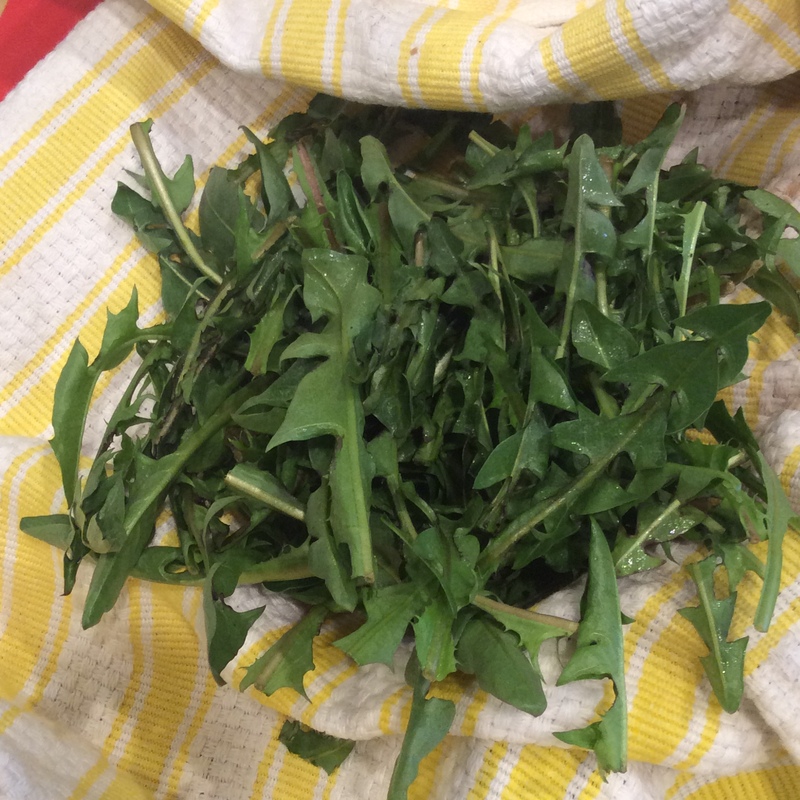 I have mentioned in another post that dandelions don’t seem to occur naturally in my neighborhood, and I went to a ridiculous amount of trouble to have them and paid good money for seeds that people in other climates would pay to get rid of. Surprisingly, they take a long time to establish. I find that they are extremely straggly and thin the first year, and only a little more substantial in the second year. But in the third year, they make beautiful thick rosettes of spring time leaves that are perfect for salads. 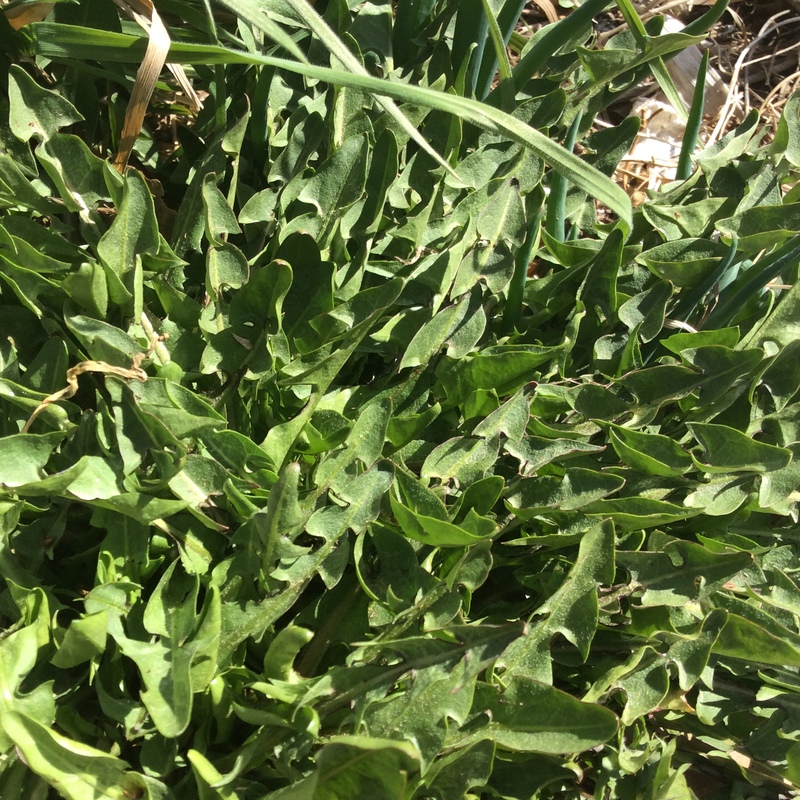 Interestingly, the dandelions growing in my garden beds are not bitter, although in general dandelion leaves are famous for bitterness. This may have something to do with my alkaline and highly mineralized soil. I’m really not sure. But it is a nice bonus. If yours are bitter, check out Dr. Kallas’s excellent book Edible Wild Plants: Wild Foods From Dirt to Plate, which contains a number of sensible suggestions about making bitter greens more appealing. All sorts of medicinal properties are attributed to dandelions, and if you’re interested in that you can read up on it. Personally, as I have said several times before, I think that all leafy greens are medicinal in that they are really, truly good for you. Eat them all, lots of them. The early spring leaves are both tender and substantial in texture. I like them in a salad either by themselves or with a little bit of outer leaves of romaine lettuce added. But if you want to add them to a more traditional mixed salad, they add a nice amount of “lift“ to the mixture at this stage. At times when I lived where dandelions or more bitter, I was very fond of adding crumbled bacon and hard cooked or Friday eggs to dandelion salads. 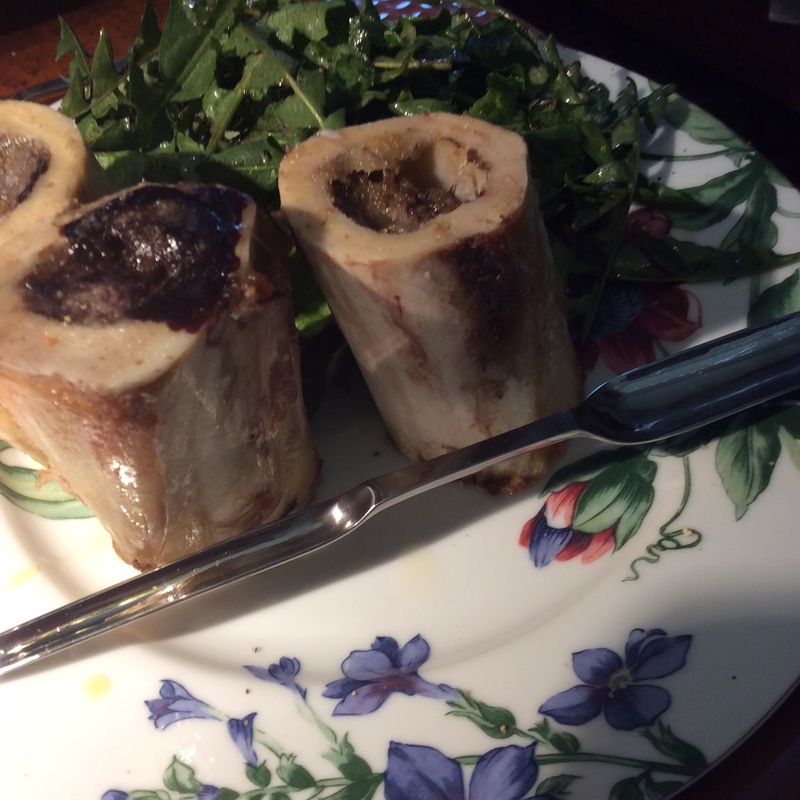 With the nonbitter leaves that grow here, I prefer to eat them just with a good vinaigrette, and maybe a few bones’ worth of roasted marrow alongside to complete the meal. 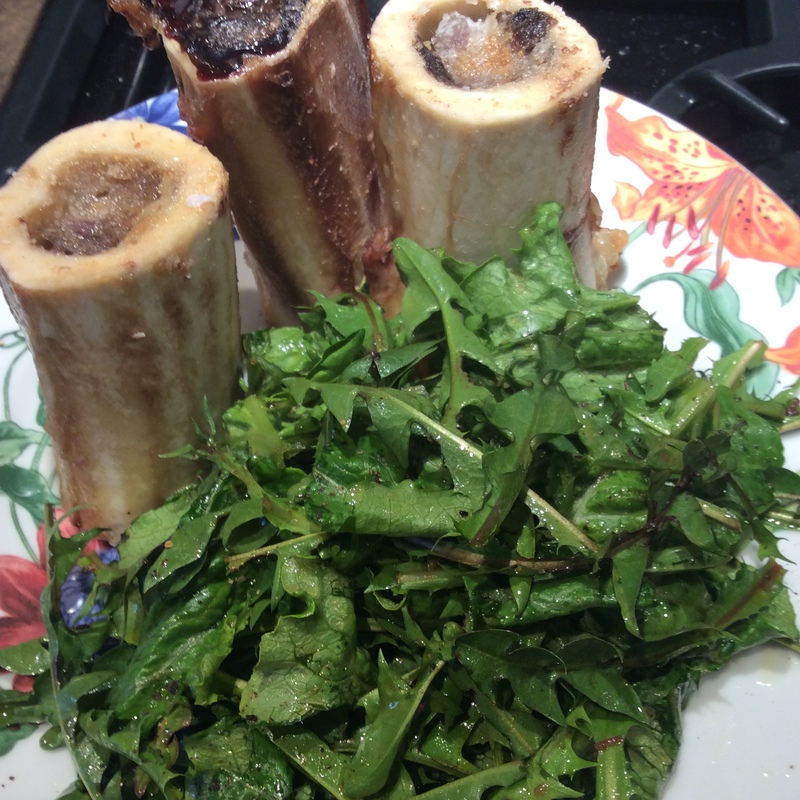 I roast the bones with salt and seasoning, then dig the marrow out and plop it on a pile of dandelion leaves dressed with good vinaigrette. Grind some pepper over the top, and yum. It’s a delicious way to stay ketogenic, but if you are not a low-carbohydrate eater, you can enjoy the marrow spread on elegant little pieces of sourdough toast. Incidentally, if you are a fan of bone marrow, you might want to keep marrow spoons around, as shown above. They have long, narrow bowls that are specially designed for digging this delicious substance out of the bone. You can get heirloom sterling silver ones from England for $700 or more apiece, or you can do what I did and buy stainless steel marrow spoons on Amazon for less than $10 each. They work just fine.